F.U.N. Club is a small Parish based group of parents, grandparents and carers and their children (from newborn to pre-school age), which creates an atmosphere of community for the youngest members of the Parish. The aim of the club is to provide the children with social play experiences, and an opportunity for the adults to share ideas, support each other and develop friendships. A typical morning at F.U.N. Club begins with the children enjoying free play. The Club has acquired a great collection of toys, books, puzzles, blocks, balls and various sporting bits and pieces over many years; all the children are well catered for. The children also get to participate in a planned activity each week The activities are determined by the collective imagination of the adults, but often the children come up with their own take on things! So far this year the children have enjoyed: cooling off with some water play; making their own paper bag puppets and musical instruments; hosting a teddy bears’ picnic; learning how to play tee-ball; and exploring music and dancing. 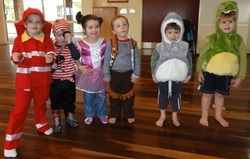 The final week of Term 1 was an Easter Extravaganza of craft, biscuit decorating and an Easter egg hunt! F.U.N. Club is always happy to welcome new members, including those who can only make it every now and again. Just be prepared for a little “organized chaos” and plenty of fun for you and your little person. For details, please contact the Parish Office on 3862 9402.